Here's another "beauty is in the eye of the beholder" car. So much of this car is beautiful; the engine, the interior... and so much of it is, uh, well, not so beautiful; the body, the chassis. Introduced in 1959 and originally called the Dart (until Chrysler threatened legal action), the SP250 was made of fiberglass and rode on a chassis "inspired" by the Triumph TR3. The engine was a Daimler 2.5 liter hemi-head V8 designed by motorcycle designer, Edward Turner (Daimler was owned at that point by BSA). The engine was said to put out 140 HP. It was mated to a 4 speed transmission ("inspired" by a Triumph transmission). The car was able to do over 120 MPH and saw 60 MPH in under 9 seconds. Four wheel disc brakes (not common in 1959) stopped the car. It's been said that Daimler, having little experience in designing a sports car body, took elements of contemporary sports cars and rolled them all into the SP250 body. That may be true as you can see a bit of Sunbeam Alpine in the rear and (if you squint) Triumph TR3 / MGA in the front. It didn't work. Even at its introduction the car was considered homely. The body had other problems besides its looks. The early cars had so much body flex that the doors were known to spontaneously open during hard cornering. The good thing, I guess, was that the suspension (also Triumph "inspired") was not spectacular and didn't encourage hard cornering. Besides its ability to go very fast and stop quickly, the SP250 had some other good points. While most British sports cars of the day had side curtains, the SP250 had roll up windows. The interior was nicely designed and comfortable compared to many of its competitors. The V8 has a great sound to it, too. The car improved over the years (including a stiffer bodyshell) and by the time it was discontinued in 1964, it was a pretty good, very fast, sports car. The body, while getting a few styling improvements, was still an acquired taste though. So all this begs the question, why buy a Daimler SP250? Really for the same reason you'd buy a big, finned American sedan. It's a piece of history. While not the greatest car to drive, it is unique and reflects a time in history when carmakers, big and small, took chances. That's something we'll never see again. We need to preserve those memories. 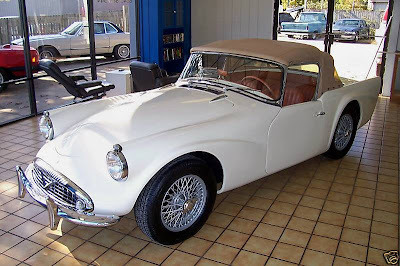 Click here to see the eBay listing for this 12,000 mile 1960 Daimler SP250. This car has just gone through an extensive restoration and comes with most of its original documents. Click here to find the Daimler SP250 Owners Club website. It really doesn't look too bad until you get to the nose. The dash looks Triumph inspired too. It is one of the great motoring mysteries as to why Daimler, who were known for large comfortable limousines and sedans, would then make a sports car.